Paris. The city of love, the city of romance, and the city with the most Michelin stars. It is no surprise then that we booked ourselves for lunch at Paris’s two most notable restaurants for us. One is ranked number 12 and the second is ranked number 35 and 2017’s Sustainable Restaurant winner. The latter will be covered in another post. 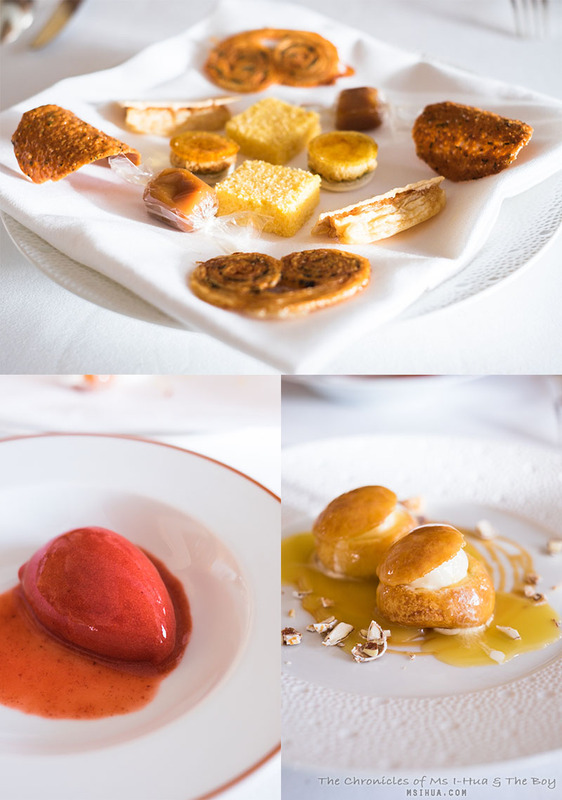 For us, the chance to dine at Arpège was a dream come true. 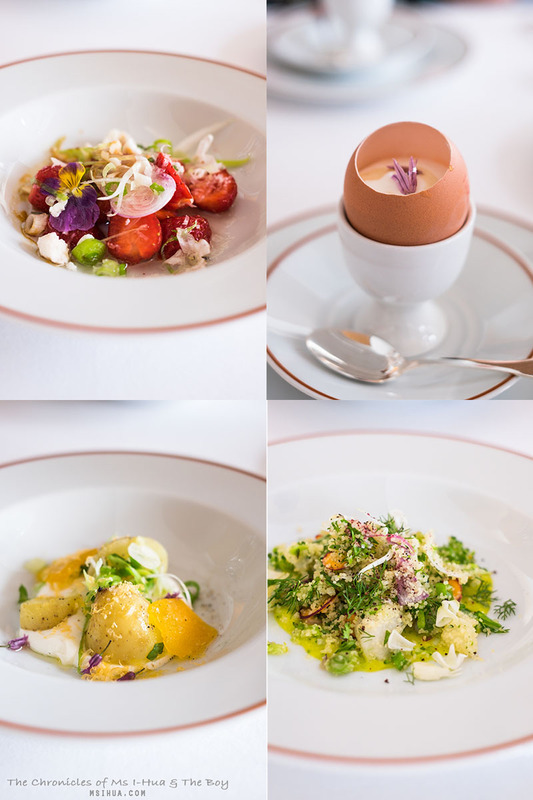 So much has been written about Alain Passard, the chef behind Arpège, and so much has been written on the restaurant itself. Heck, there’s even a Netflix Chef’s Table episode dedicated to it. The Boy has watched that episode perhaps five or more times. I know I have walked in to the lounge room after a night out a few times and caught him re-watching the show, admiring the genius that is Passard. So it was, after a few hours in the Louvre, spent admiring medieval art, and elbowing fellow tourists to take some photos that will forever be archived into our shared drive at home, never again to be seen and perhaps only shown to friends and family who dare visit, and take us up on the offer of, “care to see some of our holiday in Europe photos?”, we found ourselves in a taxi to Rue de Varenne. Luck would have it, that we were in Paris the weekend of Emmanuele Macron’s inauguration ceremony, which meant that there were many roads that were still closed around the Parliamentary area and traffic was horrendous! After some strongly worded negotiation from our taxi driver to the policewoman, we were let through the road and dropped off at our destination. Upon arriving, we were greeted by the staff and promptly seated at our table, and asked if we would like a glass of champagne (which we politely declined), and were then left to ourselves for a good 10-15 minutes. There were no further interactions from the staff at this point, no menu, no introductions. I was close to wondering if we had made a faux pas by declining their champagne offer! Once the staff deemed we were approachable once again, we were handed the menus (The Boy’s with the prices indicated, mine without). We quickly concluded what we wanted, which was the lunch tasting menu at €145, an 11 course adventure. If you are planning to dine here, don’t worry, the portion sizes are manageable and are more than suitable for lunch. Do note that this option is only available during lunches (at a bargain), and if you are planning to come for dinner, be prepared to spend twice as much for your meal, per person. 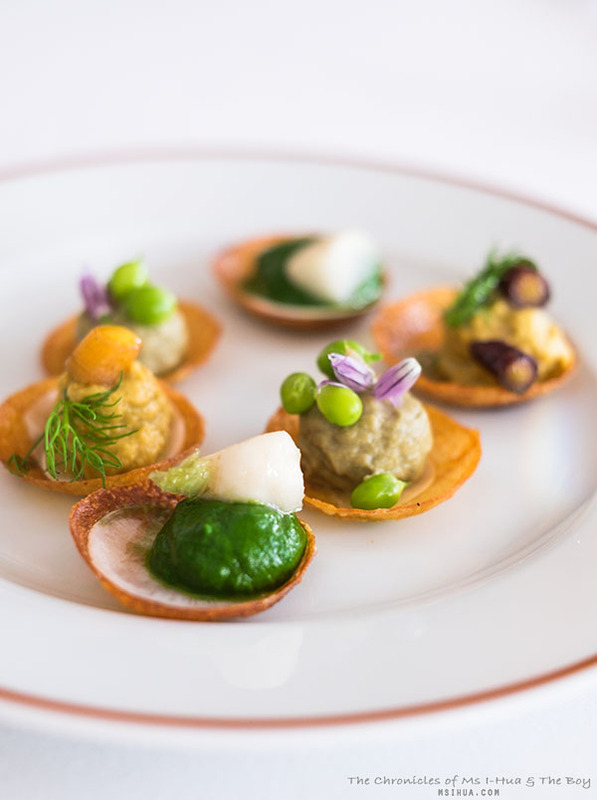 To start us off, we had some potato crisps, adorned with three different vegetable purees (spinach, broccoli and asparagus). The first proper course was mind blowing, in the sense of the ingredient pairing as well as how well it worked together it terms of flavours and textures. Strawberries, with Feta and Onions. It shouldn’t work. But it did, and oh, so well! The sweetness of the strawberries, together with the tartness of the onions melded together with the creaminess of the feta. Next up we had the signature Poached Egg, with Maple Syrup and Sherry Vinegar. Once again, the flavor matching of the dish was perfection. Every poached egg should now be compared to this king of poached eggs when I next dine out! As we were lucky enough to make it to the Spring menu, a lot of our dishes had components in it where they were at their prime before being harvested from Passard’s own garden, for our bellies. 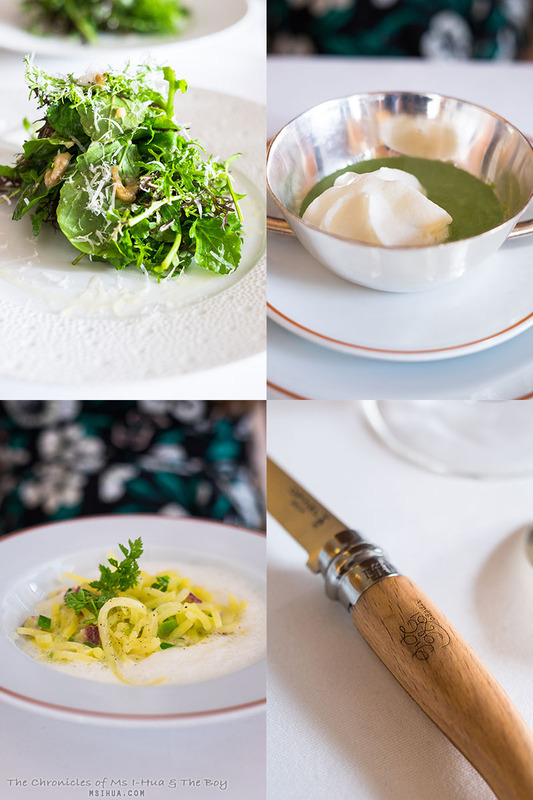 The salad of Potatoes and Maple Syrup Cream; Tabbouleh with Spring Vegetables of Carrots, Radishes, Turnips and Semolina; Mixed salad leaves with Candied Walnuts and Parmesan Cheese; and the Asparagus with Geranium and Hay Cream all paid an amazing tribute to Spring. Our next favourite dish on the tasting adventure was the Potato Spaghetti flavoured with Garlic and Smoked Eel. The complete antithesis to a Paleo spaghetti which I sometimes frequent in the form of zucchini. I’ll be sure to try and replicate this when I next feel like experimenting with potatoes! 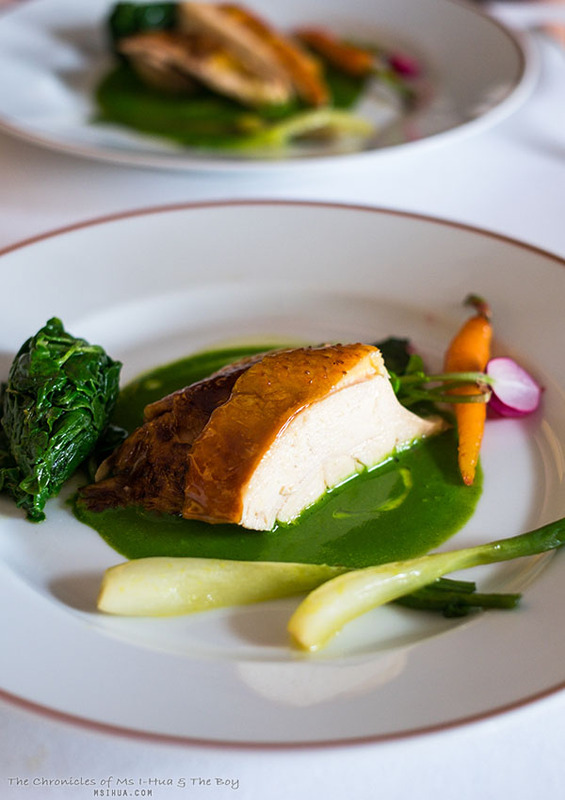 The pièce de résistance for us was certainly the Hay Smoked Chicken with Spinach. The chicken was cooked to perfection and the smokiness really came through in the skin. Almost like tea smoked, in flavor. For dessert, we had what seemed like a dessert platter of Rhubarb Macarons, Citrus Cakes, Crispy Tuilles and Palmiers; served together with an almost too-tart Strawberry Sorbet. For a second (and last) dessert, we were served Profiteroles with Hay Ice-Cream drizzled with honey flavoured caramel. So damn delicious. It was at just before dessert, which we noticed the service level in the restaurant had dropped. There weren’t many tables left by this stage (we had been there for nigh on 3 hours), and whilst I had spent the last 3 hours watching them serve the other guests to perfection (the serving trolley was right next to me), we were being served almost as if were an inconvenience to the staff. Whilst other tables were introduced to the Hay Smoked chicken in all its glory (before being carved), we were ignored, and our sorbet came to us almost in puddle form. As we completed our last dish, the staff cleared our table and placed an empty plate in front of us, prompting us to think that there would be 1 more dish. However, it must have been a discrete sign to the diner, that they needed to ask for the bill and leave, but nobody said anything to us, and we were left in the dark until the bill arrived on our table. I hadn’t noted that this was done to any of the other tables either. The staff were not engaging with the guests anymore (not that they were doing a lot of that throughout the meal). The only consolation from the human interaction bit was that Chef Passard maintained his walk-through meet-and-greet with the guests in the dining room halfway through the meal. He even took an obligatory photo with us after we requested and was completely fascinated with The Boy’s hair and earrings! It was quite hilarious! Despite the slight hiccup in service (the only hiccup we had in our entire Paris experience), the food was so good and perfect, that we let their almost indifferent attitude pass us by. Potato Spaghetti sounds fun to eat. What a great post! I’ve been talking about going to France for quite a while now…maybe it’s time to explore that country.